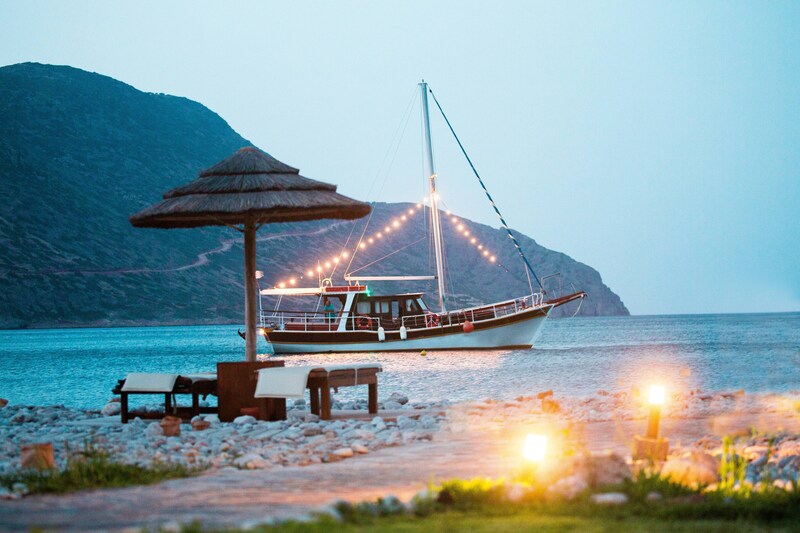 Endless views, crystal clear waters and a host of cultural and gastronomical experiences await guests at Blue Palace, a Luxury Collection Resort and Spa. 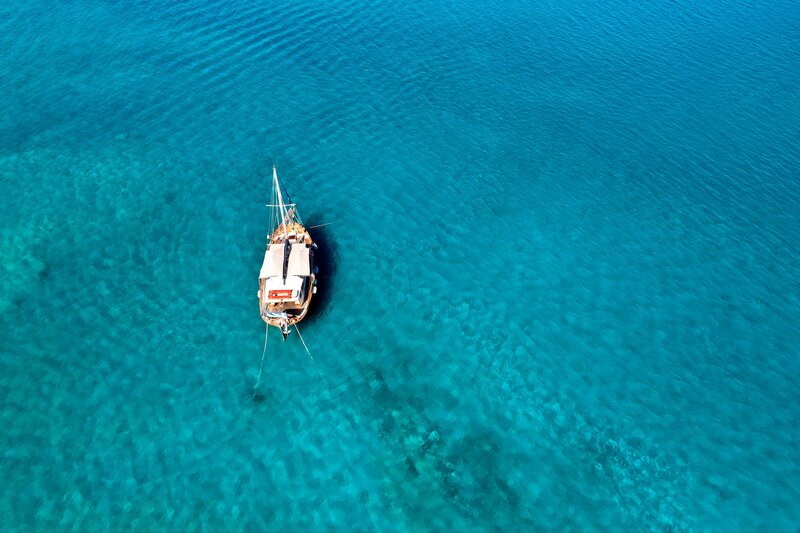 Spend a day exploring the beauty of the island with its old villages, wineries and the ancient Palace of Knossos or simply enjoy a leisurely dip in the crystal blue waters of our magnificent private beach. 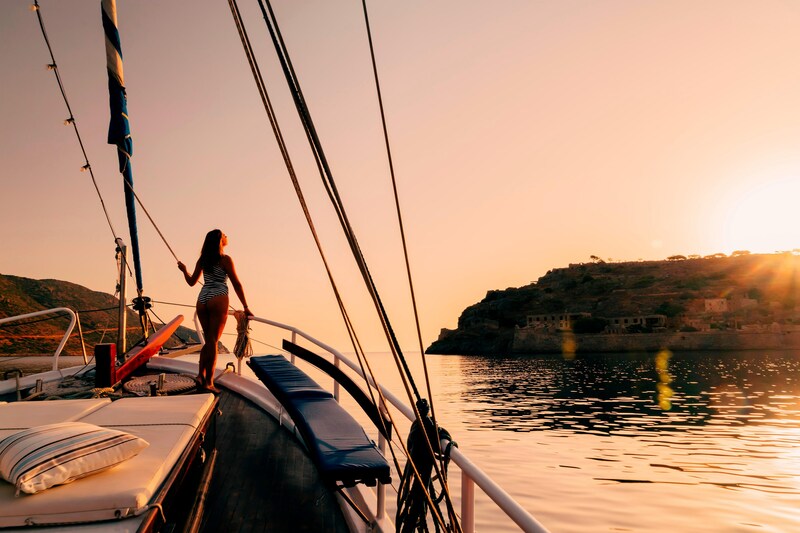 Sail the coast of Elounda and around the relics of Spinalonga island, a National Monument, aboard our traditional caique. 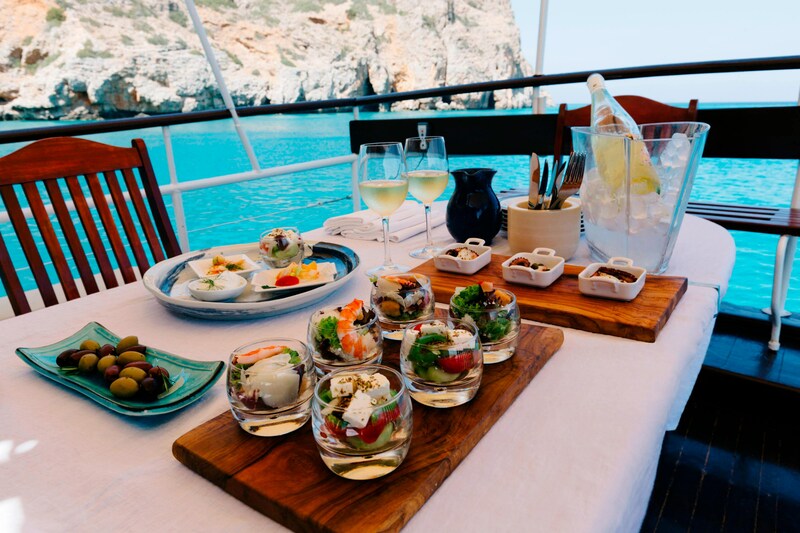 Discover unique dining experiences within five restaurants and select from a variety of exquisite Mediterranean dishes, traditional Greek specialties and cuisine with an international flair. Nourish body and soul with a signature treatment or just indulge in your own private pool, while rejoicing in a landscape of breathtaking beauty. How often is it that you find yourself swimming in crystal clear waters and gazing at an island, only a few hundred meters away, which is an official nomination for World Heritage Site by UNESCO? Discover "The Island", a circular fortress rising impressively from a rocky hillside, overlooking the vast open seas. Spinalonga, which in Greek means "long thorn", is a place full of history and memories, that reflects on a small scale Crete’s amazing past. 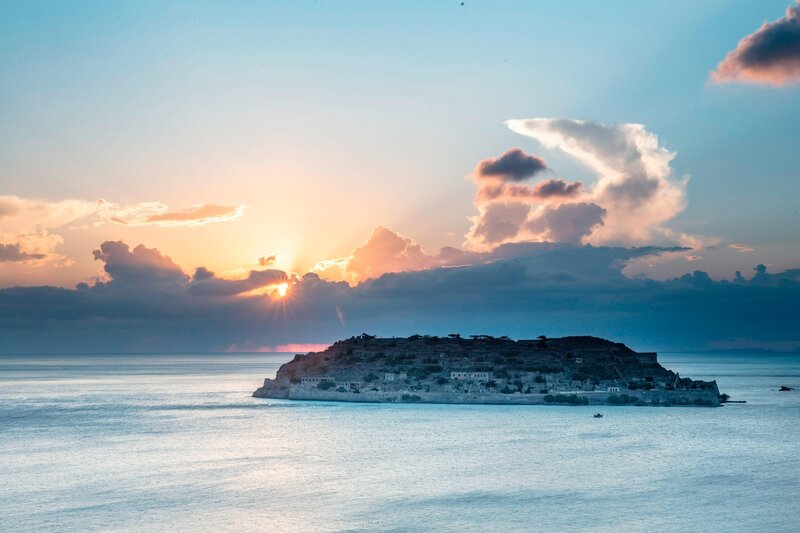 Spinalonga, a monument of outstanding universal value, contains architectural remains of different historical periods while cultural influences coexist and converse on the island. 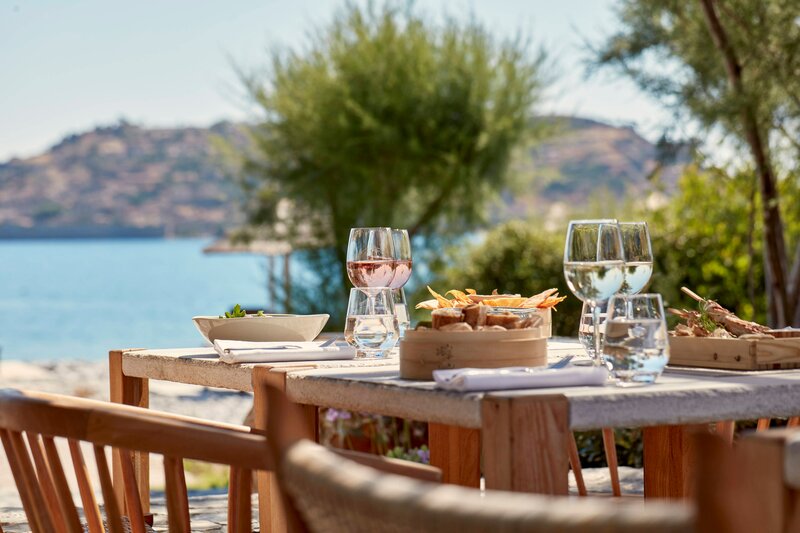 This summer we invite our guests to a truly rare and exclusive experience; to celebrate the year that Spinalonga receives the official nomination for World Heritage Site by UNESCO. Blue Palace’s interior architecture is inspired by Crete’s past and the influence of successive invaders, including the Arabs, the Ottomans and the Venetians. Rugs, divans, tiles and antiques are offset by natural stone and wood. 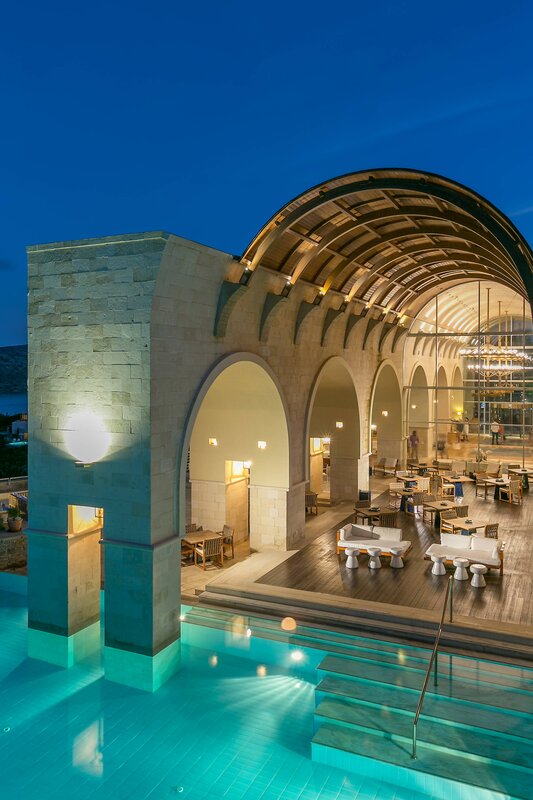 The beguiling blend of cultures culminates in a faithful reproduction of the Venetian Arsenali, or shipyard, at Heraklion, an 11-metre high vaulted hall that makes a stunning frame for views of Spinalonga, and a natural spot for cocktails or iced coffee. The guest accommodations at Blue Palace include 52 suites and four private villas, with 142 private pools. Exquisitely decorated, offering understating luxury, these are all designed for people who want to spend a lot of time relaxing in their own private space. An array of exclusive services, including private seating and private menus at breakfast, private verandas, gardens and pools are designed to enhance the lovely views and the feeling of freedom. The tranquil aesthetic in each individually-designed space evokes calm, and yet energizes. Many of the spacious rooms and suites boast private infinity pools that appear to merge with the sea, expansive verandas, sun drenched balconies or peaceful gardens. A fresh, clean palette punctuated by shades of blue, billowy fabrics, contemporary furnishings and unique decor combine to form a uniquely compelling and peaceful place to be. Our exclusive collection of suites and villas offers the ultimate in privacy, luxury, amenities and services. Drawing inspiration from the island’s natural beauty and vast historical influences, the suites are awash in a fresh, clean palette punctuated by shades of blue. Our beautiful, traditional wooden caïque is a gem, and every voyage it makes is part of a bespoke experience. This is actually the kind of hospitality Cretans like to offer each other; a day out on the water, in good company, with exceptional food and wine. Be exhilarated by the sea air and then, when the breeze is off the land, be seduced by the scents of warm earth, wild thyme, sage, dittany, lavender and citrus groves. Intoxicating, even without the fizz. 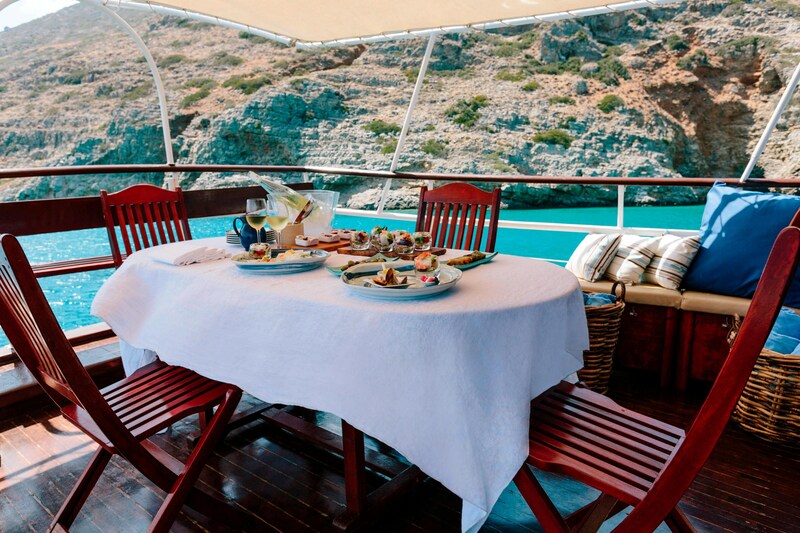 Sail away on a sunset cruise around Spinalonga, with a breath of sea air air to sharpen your appetite for the exquisite canapes served with your champagne. Large bonfires are lit at our private beach for the cooking of the famous “antikristo” lamb, while authentic local delicacies are prepared on the spot; all under the distinct tunes of Cretan lyra. A unique cultural and gastronomic experience and an opportunity to eat, drink and celebrate life with family and friends like a true Cretan. There are so many opportunities to celebrate life in Crete: good music, endless dances and the festival culture under the full moon, next to the sea, within vineyards or on the top of the mountains. 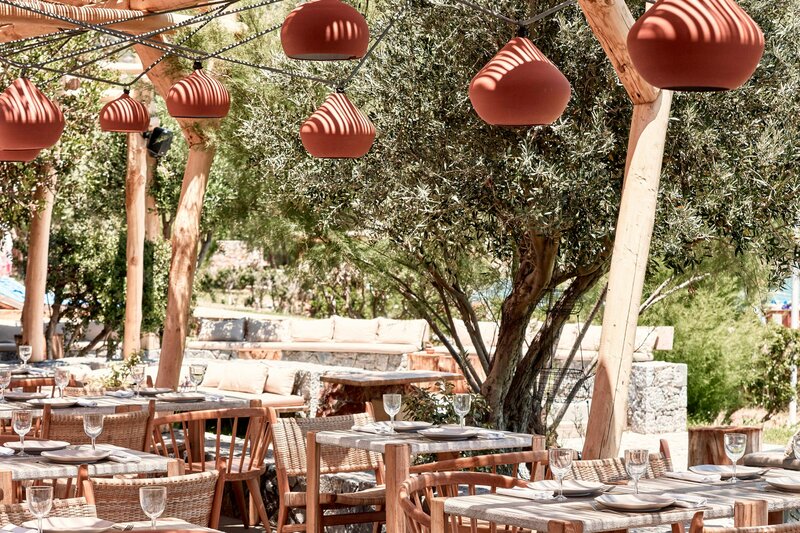 Immerge into a Cretan epicurean exploration, while rejoicing in a landscape of breathtaking beauty by the sea and enjoying the unmatched facilities and unparalleled service of Blue Palace Resort & Spa. 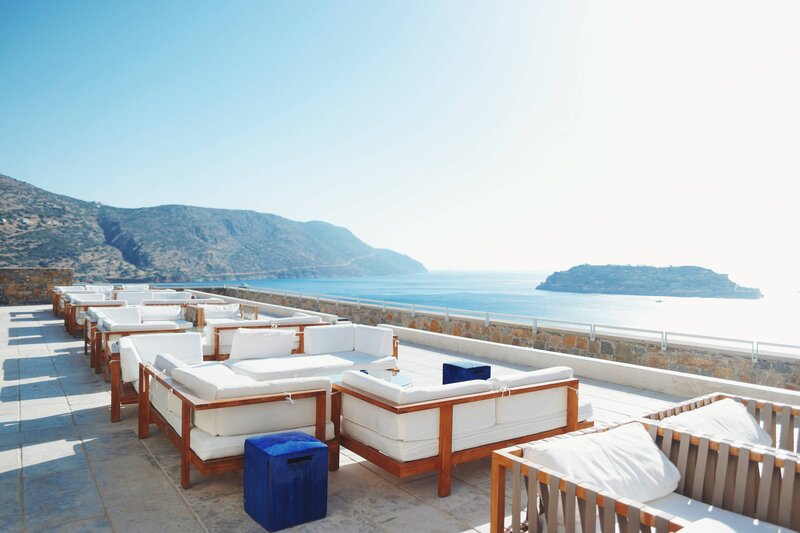 At the Beach Club, you can enjoy the effortless cool of lazy summer days. 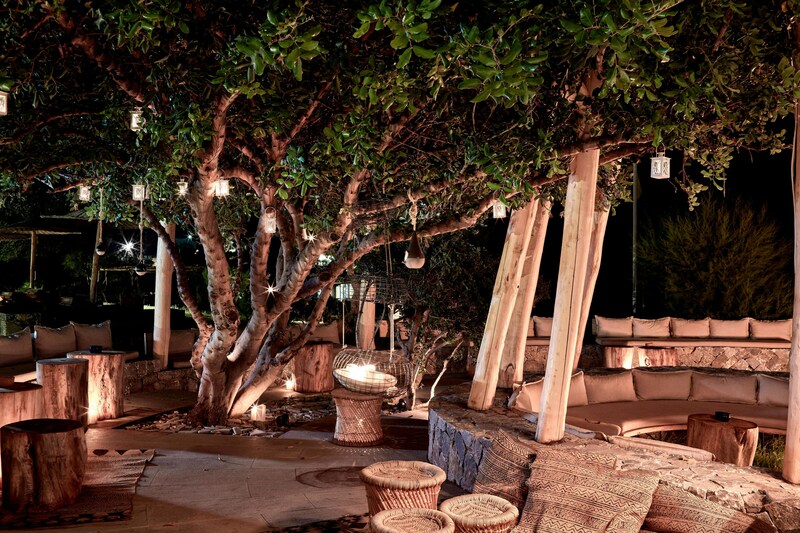 Set amongst olive trees, the spiral stone building is where our DJ weaves the musical spells of the moment, conspiring with top mixologists and our madly inventive chef to deliver the Cretan beach experience at its most alluring. Daybeds, loungers and swings will set the mood during the day lending itself to breezy nights around the fireplace and full moon parties. 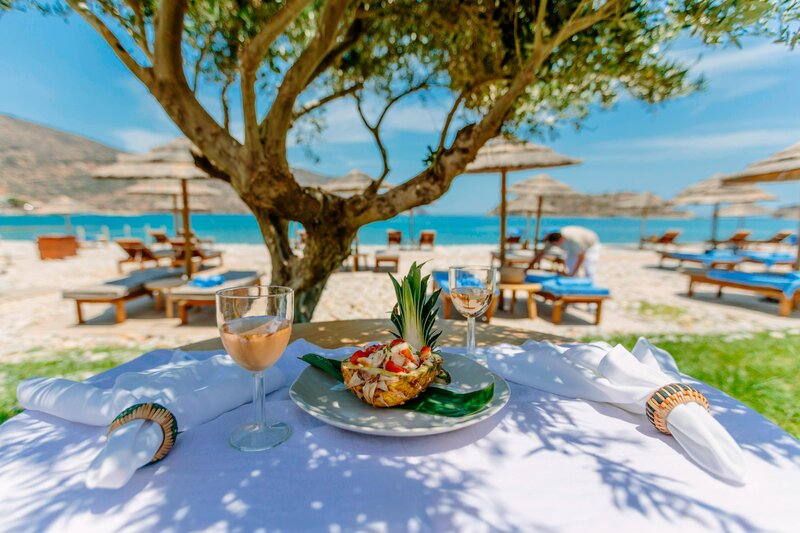 Set amongst olive trees and overlooking the shore, the celebrated Isola Beach Club offers a relaxed bohemian ambiance paired with light and refreshing beachside dishes, served also at the privacy of your sunbed.